The long-awaited release of Kool Keith, Dan the Automator, and DJ Qbert’s sophomore album is finally here! The mystical extraterrestrial, also known as Dr. Octagon, makes a triumphant return in Moosebumps: An Exploration Into Modern Day Horripilation, out on Friday, April 6 via Bulk Recordings. The psychedelic and surreal sounds of Dr. Octagon shook up the rap game back in the 90s and now they’re back to do it again for what Kool Keith calls, “one of the best sophomore albums recorded” in an interview with The FADER. In honor of the trio’s 22-year reunion and the new album, we’ve compiled a list of facts that you need to know before seeing them on Thursday, April 5 at Brooklyn Bowl New York! Kool Keith, the creator of Dr. Octagon, built his reputation as the breakout star of Queens hip-hop crew Ultramagnetic MCs. Evolving from the New York hip-hop scene, Kool Keith moved to California for musical inspiration. This move would eventually lead him to sharing an apartment and making music with KutMasta Kurt, who helped out Keith with originally creating Dr. Octagon. These songs were sent to radio stations as a teaser, as well as to Bay Area legend, Dan “The Automator” Nakamura. This sparked Dan’s attention, which ultimately led to the formation of Dr. Octagon and the recording of their first album, Dr. Octagonecologyst. The album took only 14 hours to record in it’s entirety. Kool Keith’s surreal and descriptive lyrics, filled with mind-bending imagery and candor, combined with the revolutionary blending of genres such as trip hop, rap, rock, and techno, affirmed the album as a milestone in the history of hip-hop. The New York Times dubbed the album a “far-out odyssey [that] would be the hip-hop album of the year, boasting virtuosic turntable scratching, compellingly laid-back grooves and tales of alien worlds and advanced physics that explore rap as science fiction.” back in 1997. As Keith vividly describes, Dr. Octagon has yellow eyes, green and silver skin that changes to blue and brown, a pink-and-white afro, and a brain that glows different colors. He also wears X ray sunglasses, hard shoes with razor blades, and says that he can change his face with the press of a button and disappear. The gory and descriptive imagery that Kool Keith provides further proves how he experimented with non-traditional subject matter and made his mark in the evolution of hip-hop lyrics. Dr. Octagon was murdered by Dr. Dooom on the 1999 album First Come, First Served, and was briefly brought back to life before once again being killed on the 2008 album Dr. Dooom 2. Kool Keith’s other alter-ego, Dr. Dooom, was created as he began to experiment outside of the Dr. Octagon project. Dr. Dooom fulfilled Kool Keith’s desire to stray away from the alternative nature of Dr. Octagon and back to his roots in street-level hip-hop. The infamous Dr. O made a brief appearance on the 2013 Yeah Yeah Yeahs album Mosquito. They were featured on “Buried Alive” and added an especially ominous twist to the song with their unique rap verse. In honor of the albums 21st anniversary, the trio played 3 shows in Los Angeles and San Francisco, marking their first-ever live performances as Dr. Octagon. 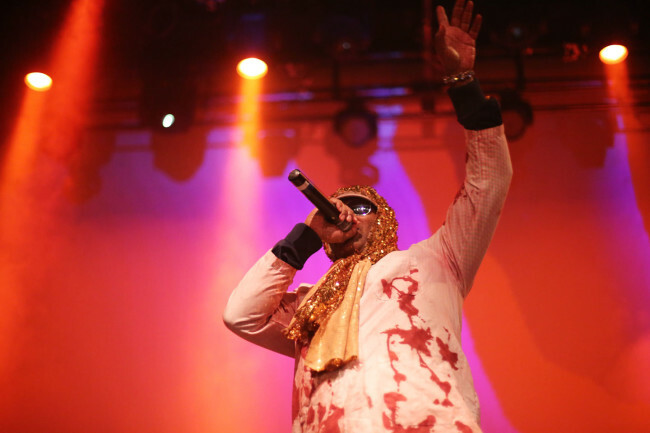 San Francisco’s CBS news reported that the line wrapped around the block for the trio’s first-ever live performance, and Kool Keith fittingly showed up wearing a blood-splattered hoodie and apron. They also reissued Dr. Octagonecologyst on vinyl with a number of previously unreleased bonus tracks for the anniversary. On February 15, 2018 the trio released their single “Octagon Octagon” from disc 1 of their upcoming sophomore album. Rolling Stone reported that “‘Octagon Octagon’ fittingly opens with tabloid-ready headlines proclaiming Doc Oc’s return, after which Kool Keith unleashes a dizzying list of Octagon’s outrageous branding ventures over dusty drums and ominous choral vocals”. On March 2 they also released “Area 54”, which is featured on disc 2 of their new album. The tunes stay true to the free-flowing, deranged lyrics of Kool Keith that put the original Dr. Octagon tracks in a league of its own.